The most important thing about SwimFin is this: the more submerged it is, the more support it is giving. 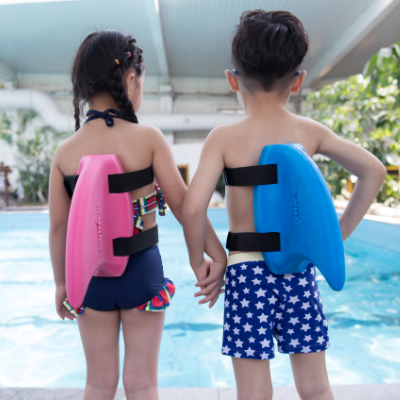 This means when the child is vertical, doggy paddling through the water, SwimFin will be almost completely submerged, giving maximum support. As the child’s body position becomes more horizontal, SwimFin comes out of the water giving less support. This means the child is swimming more for themselves with less and less assistance. And SwimFin never has to be inflated, deflated, or need to have additional support added or removed as with armbands/discs, body vests etc. Remember, the more visible it is, the less it’s working! We’ve also heard from instructors who use SwimFins to teach people with special needs. We know Olympic athletes who’ve used one for training purposes and schools that use them for aqua-aerobic exercise classes. There’s a swimming school in New Zealand that uses them in a class where the children are aged between twelve-months and two-years of age. All over the world, SwimFin has found uses that have surprised even it’s inventor. SwimFin has passed both EN71 Toy Safety and EN13138 Buoyancy Aid International Safety Standards.